Somarant tablet: Each tablet contains Suvorexant INN 10 mg.
Suvorexant a highly selective antagonist for orexin receptors OX1R and OX2R. The mechanism by which Suvorexant exerts its therapeutic effect in insomnia is presumed to be through antagonism of orexin receptors. The orexin neuropeptide signaling system is a central promoter of wakefulness. Blocking the binding of wake-promoting neuropeptides orexin A and orexin B to receptors OX1R and OX2R is thought to suppress wake drive. 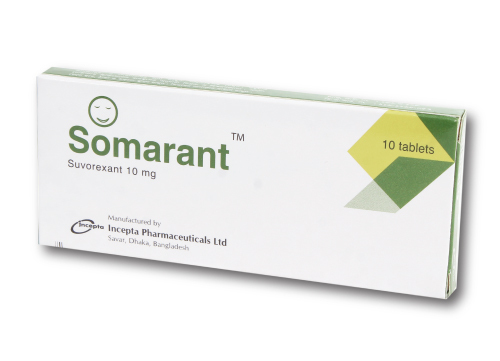 Somarant is indicated for the treatment of insomnia, characterized by difficulties with sleep onset and/or sleep maintenance. Use the lowest dose effective for the patient . Recommended dose is 10 mg, no more than once per nighttaken before 30 minutes of going to bed, with at least 7 hours remaining before the planned time of awakening. If the 10 mg dose is well-tolerated but not effective, the dose can be increased, not to exceed 20 mg once daily. Time to effect may be delayed if taken with or soon after a meal. Daytime somnolence: Risk of impaired alertness and motor coordination, including impaired driving; risk increases with dose; caution patients taking 20 mg against next-day driving and other activities requiring complete mental alertness. There are no adequate and well-controlled studies in pregnant women. Somarant should be used during pregnancy only if the potential benefit justifies the potential risk to the fetus.